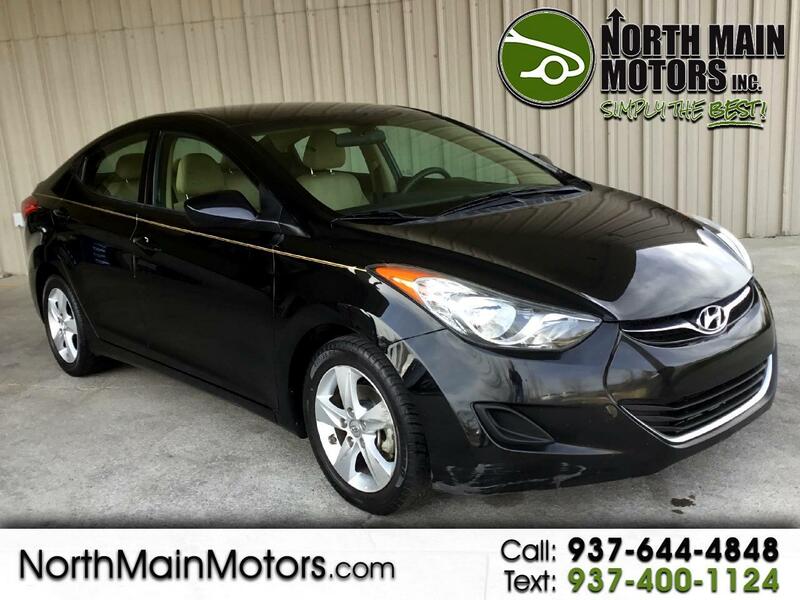 North Main Motors is honored to offer this great 2013 Hyundai Elantra GLS In Midnight Black. This vehicle is beautifully equipped with Option Group 01 (60/40 Split Fold-Down Rear Seatback, ABS w/Electronic Brake Force Distribution (EBD), Adjustable Head Restraints, Advanced Dual Front Airbags, Bodycolor Door Handles & Mirrors, Center Console w/Storage Compartment & Armrest, Daytime Running Lights, Dual Heated Power Outside Mirrors, Electronic Stability Control, Front & Rear Door Map Pockets, Front 2-Speed Intermittent Wipers, Lower Multi-Box w/Cover, Manual Air Conditioning, Map & Cargo Area Lights, Motor Driven Power Steering (MDPS), Power Door Locks, Power Windows w/Driver's Auto-Down, Rear Defroster, Remote Keyless Entry System w/Alarm, Solar Glass, Steering Wheel Mounted Cruise Control, Telescopic Steering Wheel, Tilt Steering Wheel, Tire Pressure Monitoring System, Traction Control System, Trip Computer, Trunk Lid Inner Cover, Vehicle Stability Management, and Windshield Shade Band), 4-Wheel Disc Brakes, 6 Speakers, ABS brakes, Air Conditioning, Alloy wheels, AM/FM radio: XM, Brake assist, Bumpers: body-color, Cargo Net, Carpeted Floor Mats, CD player, Delay-off headlights, Driver door bin, Driver vanity mirror, Dual front impact airbags, Dual front side impact airbags, First Aid Kit, Front anti-roll bar, Front Bucket Seats, Front Center Armrest w/Storage, Front reading lights, Front wheel independent suspension, Heated door mirrors, Illuminated entry, Low tire pressure warning, MP3 decoder, Occupant sensing airbag, Outside temperature display, Overhead airbag, Overhead console, Panic alarm, Passenger door bin, Passenger vanity mirror, Power door mirrors, Power steering, Power windows, Premium Cloth Seating Surfaces, Radio: Autonet AM/FM/CD/MP3 w/SiriusXM Satellite, Rear seat center armrest, Rear window defroster, Remote keyless entry, Security system, Speed control, Speed-sensing steering, Split folding rear seat, Tachometer, Telescoping steering wheel, Tilt steering wheel, Traction control, Trip computer, and Variably intermittent wipers! From the moment you step on our lot until the time you drive away in your next car, your buying experience with North Main Motors is our number one priority. We encourage you to use the expertise and resources of our sales staff - they are here to help you find the right car at the right price. Call us today at 937-644-4848 to schedule your test drive!